I have some sad news everyone. 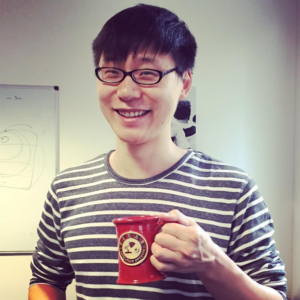 After 6 years of amazing work, Xinyu "Jerry" Hou is moving to Canada to start a new life with his fiancée, Ran. Jerry, we will all miss you dearly, not least since you're the first person I hired at Symless, but also because of your amazing contributions to Synergy over the years. Jerry's story starts back in 2012 when he started work at Symless as employee number 1. This was when we were known as "The Synergy Project". 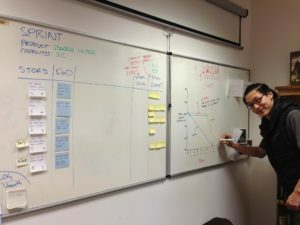 Jerry finishing off the burndown chart (2013). Jerry and his new haircut (2017). It's been an amazing 6 years, and a lot of what we've achieved couldn't have been done without you, Jerry. You will be missed. So, Andrew and Steve are now on the hunt for a new C++ developer to join the Synergy development team. Jerry will be working remotely for 3 months from May, but remote working over a different timezone introduces a lot of really difficult communication issues (which I've experienced first hand when we had a San Francisco office as well as a UK office). For that reason, we're hiring a replacement for Jerry; someone who can fill his spot here at our UK office and give us an in-person, IRL presence. Unfortunately, it's going to take us 6-12 months to get the new guy or gal up to Jerry's level, as he's leaving an enormous knowledge gap (in terms of both the understanding of Synergy's code base and his fantastic C++ skills). We were planning to hire a new junior dev around this time, but this will set us back a while (we plan to grow the Synergy development team to 4 people by the end of 2018). So, we're looking for a new Software Engineer to join our team here in our UK office (Camberley, Surrey). If you know someone who's looking for a C++ job, please could you pass this along to them? While nobody can replace Jerry completely, we're hoping our new hire will bring just as much to Synergy and our company culture as Jerry has done! All that remains is for me to say an enormous thank you to Jerry, and we all wish him the very best of luck on his adventures in Canada.